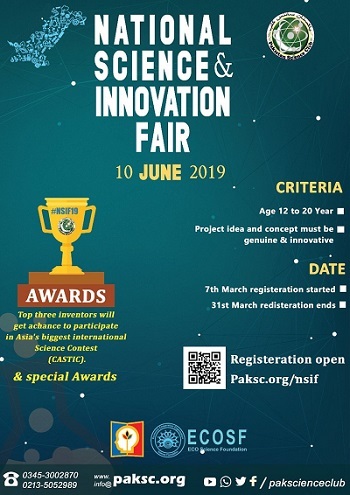 National Science & Innovation Fair is jointly organised by ECOSF in collaboration with Pakistan Science Club and Maths Science Pakistan on July 10, 2019. Participants from Pakistan are invited to present and compete their research on various fields of science and technology. The Winners will get a chance to participate in Asia's biggest international Science Contest CASTIC with more than 60 countries participating from all over the world. Age between 12 to 20 Years. Project idea must be innovative and genuine.